You will feel special with Maxx Royalty service from the moment you step into the magical world of Maxx Royal Resorts - where every detail is carefully designed. Maxx Assistant – your personal holiday assistant - is always by your side. Our assistants manage all your needs from restaurant reservations to pillow selection, from a personalised sports calendar and special events preparations - for an absolutely unforgettable holiday. Maxx Royal Resorts extends its privileged services to every moment of your special holiday. Freezone, created for guests who are waiting for flights, transfers and bookings, offers an exceptional experience with a luggage system, a shower area, changing rooms and a relaxation room. Guests who wish to explore the historical and natural beauty of Antalya and its surroundings are welcome to take a helicopter tour. Book your place at Maxx Royal Resorts for a unique aerial tours of the most exclusive addresses in Aspendos, Bodrum, Oludeniz, Dalaman, Belek, Kemer, Gocek, Pamukkale, Myra, Side, Cappadocia and Ephesus. Maxxiland Smiling Babies provides special babysitting services for children aged 1 to 3 years old, until 02.00. Families may enjoy their vacation while kids are having a great time with professional childcare specialists. You can benefit from discounts and privileges on transportation options offered by the Royalty Card and Maxx Royal Resorts. Maxx Royal Resorts offers free helicopter transfers to and from the resorts for guests staying a minimum of 7 nights in our special Villas and King Suites. Guests may also rent a helicopter on a daily basis. A comfortable and luxurious journey awaits Maxx Royal Guests who choose to book a private jet charter from the city of their choice to Antalya Airport. Maxx Royal Resorts offers its guests VIP Transfer Services ( a private inland service between the hotel and the airport ) featuring luxury vehicles and many privileges. Explore international cuisine, enjoy shopping in exclusive stores, and experience a unique holiday in the Maxx Royal World with our app. Stay tuned for more activities on holidays. International cuisine at Maxx Royal Resorts prepared by renowned Mexican, Filipino, French, Australian, Russian, Italian and Japanese chefs. Enjoy shopping in stylish Maxx Royal boutiques featuring designer accessories, shoes, beach clothes and exclusive items. Maxx Royal is at your fingertips with our mobile app. Through this application you may follow activities, restaurants and special events, as well as provide feedback about your hotel experiences. Get ready to enjoy great Maxx Royalty Card privileges at the Maxx Royal CIP Lounge, CIP Terminal, the stores, à la carte restaurants, SPA and many other venues at the resort and for aircraft and helicopter charters! With the Royalty Card you can enjoy many privileges at a discount or free of charge throughout your stay. The special advantages of your card allow you to sample exclusive menus at the Emerald Members Club serving Maxx Royal Kemer Resort villa guests, and at Villa Restaurant serving Maxx Royal Belek Golf Resort villa guests. In addition, a Royalty Card offers you the opportunity to experience both facilities daily. During your stay, you may spend time at both Kemer and Belek - and transform your holiday into an even more extraordinary experience. 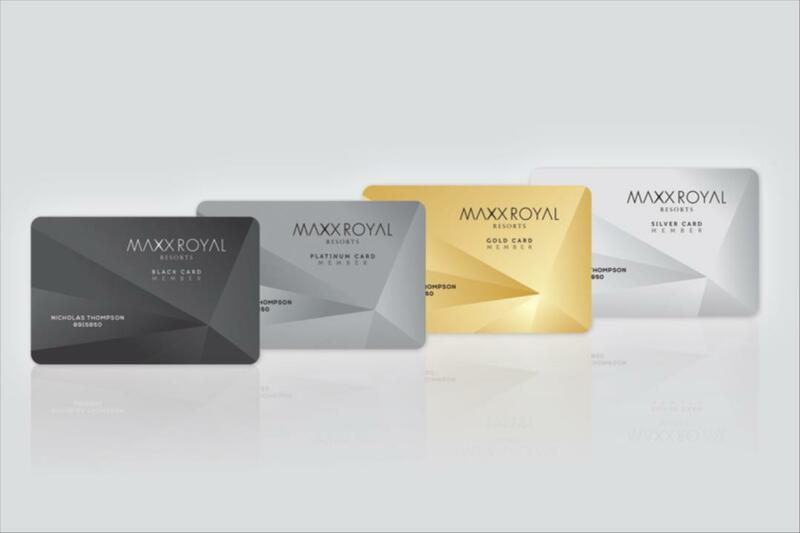 Maxx Royalty Card Program offers you advantageous rates and services to enjoy throughout your holidays at Maxx Royal Resorts.